I am doing some premarital counseling for a couple I am marrying later this summer. We are using this book by Les and Leslie Parrott, professors at SPU. It has accompanying workbooks for the man and woman. 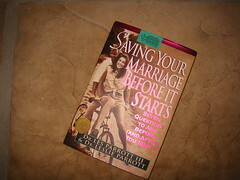 It's one of the best resources I've seen for premarital counseling. After meeting with the couple this afternoon, I scrubbed the boat inside and out, and then washed the cars. Bjorn's friends came over this evening with their laptops which made two powerbooks, two iBooks and an eMac putting our Airport to the test. It was really this G3 iBook that I bought almost four years that got it all started. We later gave Bjorn a Powerbook for his graduation. Since then Pat got a G4 iBook, John got a G3 iBook and later a G4 iBook, Stacy bought John's old G3 and recently Jeff got a Powerbook. All were former PC users. At least college students know a good thing when they see it!